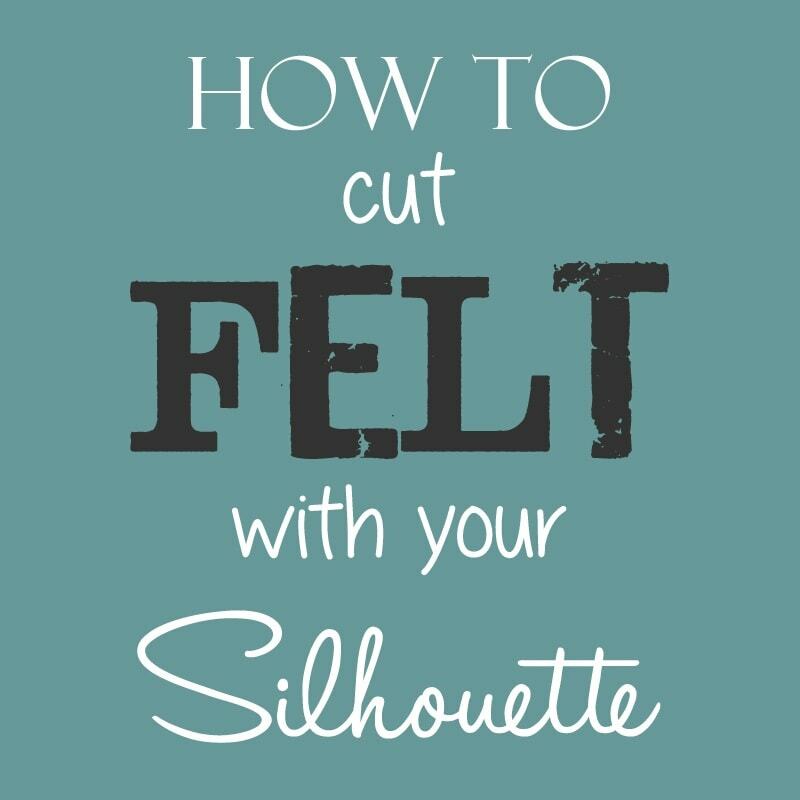 Yes, you read that right, you CAN cut felt with your Silhouette! Before you get too excited, there are a few things I must tell you. First, this method will mess up your mat a bit faster than “normal” cutting would; second, you have to iron fusible webbing onto the back that will not come off; and last, sometimes it doesn’t work, sometimes it does. All of that being said, using my Cameo to cut felt saves me a TON of time so it’s all worth it! 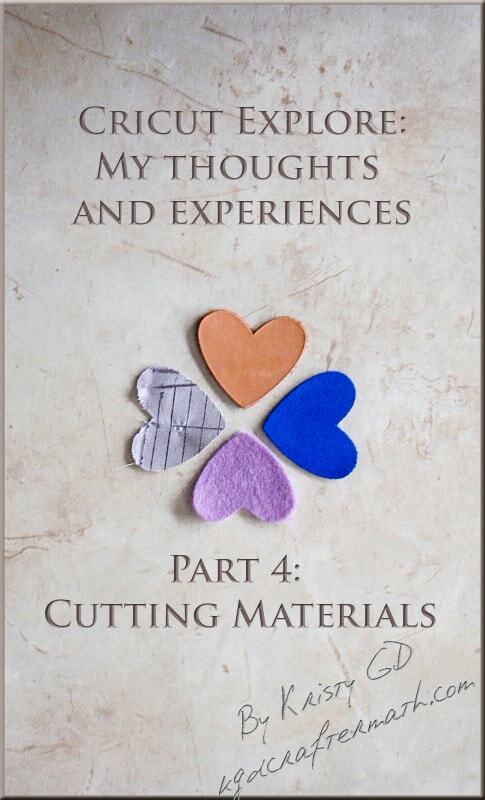 Be sure to read my updated post on cutting felt with the Silhouette Cameo 3 and deep cut blade! -I have cut both acrylic (craft store) and wool blend felt on my Cameo. Both worked, but the wool blend definitely had better results. The acrylic looses detail around the edges where the wool blend doesn’t. You can check out my post about different kinds of felt here. -First thing you need to do is iron fusible interfacing onto the back of your felt. I use Wonder Under (Pellon 805). Peel the paper backing off and place with Wonder Under down on the mat. -Set your fabric blade to 10, depth to 33, speed to 3, and check the double cut box. Using such a high blade depth is what can jack up your mat, also I’ve noticed that sometimes the webbing leaves residue on the mat. Hopefully that helps someone. I actually bought the machine to cut things out of felt not knowing if it really would, and I am so glad that I did! I can tell you that I have successfully cut a ton of felt with it without any problems. Saves me so much time! Check out my etsy shop to see what I did with the felt in the video. Make sure to check out part two of this post where I show how different kinds of felt cut. And go take a look at this post from my friend Kristy at Please Excuse My Craftermath where she tests out what the new Cricut Explore can cut. I’m very interested in this machine! 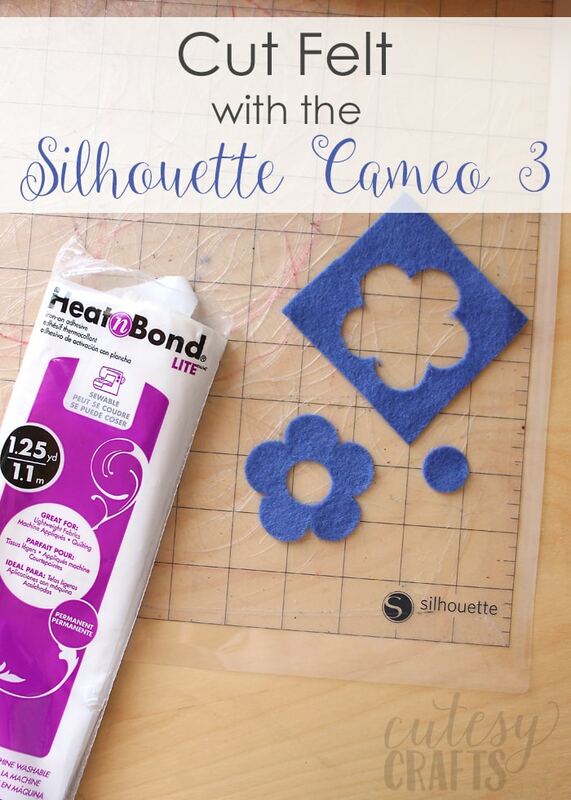 And finally, check out my updated post on cutting felt with the Silhouette Cameo 3! Holy awesomeness, Batman! This is even cooler than I imagined. Thank you so much for venturing into uncharted waters and making a video. As a visual person who loves seeing a project in action, this helped a TON. Off to tell my friend about it who asked if the Cameo could cut felt. Also, pinning this to share with my Silhouette board followers! Oh the things that I could do if I had a silhouette. I should be saying this to my husband! 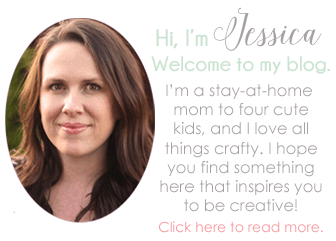 Thanks for stopping by and linking up to Fluster Buster’s Creative Muster Party! Looking forward to seeing what you’re going to link up next week. You’re awesome, Jessica!! I’m also a member of Lauren’s Silhouette Challenge but I actually found this tutorial through google. Thank you so much for this great tutorial! Great tutorial! I love making things with felt but cutting circles and alphabets drives me nuts. Even if I go though a lot more mats it will still be cheaper than investing in a bunch of dies for a manual machine. I know! I hate cutting numbers and letters by hand! Glad you found it useful. It doesn’t make it completely smooth, but it definitely isn’t stringy like the felt is. No sure exactly how to describe it. Where can you find the wool blend felt? Thanks for the great video. You did a great job for your first time! I was bummed that my new Silhouette couldn’t cut felt, but now that I see that it can, I’m totally going to do it. Appliqueing felt is one of my favorite things and doing it by hand is so tedious. I need to get a fabric blade though, I don’t have one of those yet. Thanks Tina! The fabric blade is the same as the regular blade. It’s just a different color so you don’t mix them up. You just want one that hasn’t been used for paper. Just like you don’t want your sewing scissors used for paper. Oh, thanks Jessica! I didn’t realize. I might already have a second blade that I could use. I will need to check. I just got it a few months ago and am still trying to figure out how to use it. Excited to try it out though. The felt that I normally use says it’s about 2 mm thick, so I would go with the thinner one. Jessica, thank you so much for this tutorial! I am a more visual person as I was a little nervous about cutting felt. Do you recommend the 20% wool/80% rayon or the 35/65? You’re welcome! I use either blend depending on what color I want. I don’t really notice a big difference between the two. They are both great! Thanks for posting this. I have seen it mentioned several times to not cut felt as Silhouette people said it voids your warranty. No clue where. I really want to try this though as I want to use it to cut out felt clippie embroidery designs. I think I remember reading that in some forum somewhere. I’ve never heard it from Silhouette itself. It was worth it for me though, especially since I was using it to make money. Thanks for this post!! I had heard that the Silhouette can’t cut felt so it was nice to actually see how well it does cut it. I have a question! Is the Wonder Under used just so you can easily applique the felt after you have cut it, or do you use it as a barrier to prevent the little fibers from the felt from sticking to the mat? I guess I’m just wondering how necessary it is to use it if I’m not going to be appliqueing the felt to anything. Thank you for showing us that it is possible to cut felt with the silhouette! I’m going to try this tomorrow. 5 haters? Unbelievable! You get five thumbs up from me! Hahaha! Thanks Michelle! Hope it works for you! Great job with your video! I thought you were fabulous and I’m so thankful that you shared how to cut felt with a Cameo! I love felt and would love to give this a try! Thank you very much for sharing!!! Thanks so much Ruth! Felt is the best! Hi There, I love this Helpful Blog. Question I usually shop at my favorite Craft Store Hobby Lobby. I see that they have Wonder Under but several different kinds such as INT. Heavy Duty White Wonder Under, Medium etc. Which one is the one you use? You can check it out at the Hobby Lobby website also to steer me in the right direction. where would I find the wool blend felt? I have Joanne’s and Micheals in my are as well! Oh yeah. They have it labeled weird. I think it’s this one http://shop.hobbylobby.com/products/int-805-reg-wonder-under-502278/. It’s called Pellon 805. You can read about the felt that I use here: https://www.cutesycrafts.com/2012/12/felt.html. The bottom lists buying options. My Joanns has a very limited color selection of it. You can also buy it online from several places. You can go to woolfelt.com to find a full list of retailers and see the colors. You will probably have the best luck with their 80/20 blend. Just so you know. There is no difference in the fabric and regular blade. Silhouette uses the blue casing is only used so that the user knows which one s/he has used on fabric. The blades themselves are no different. Yep, you’re right. No difference. Where do you get your wool blend felt? I list some different retailers on the bottom of this post: https://www.cutesycrafts.com/2012/12/felt.html. You can contact the manufacturer for a full list. Great tutorial! Thank you so much! Have you tried cutting the rectangular felt you get from the craft store? If so, what were your results. Thanks Jan! Glad you like it! I’ve found that the most important factor is the type of felt you are using. A wool/rayon blend is going to give you much better results than acrylic. I made a second post/video that explains. Also, make sure you are adjusting the blade itself by taking it out and turning it. They just came out with a deep cut blade that I am really excited to try, so that might be an option as well. Sorry you are frustrated. I am part of a Silhouette Facebook group that is full of knowledgeable and helpful Silhouette users. Let me know if you want to join it, and I’ll send you the information. Hey Jessica! I’m trying to cut felt to sew onto towels. In the past I used a material like the wonder under (can’t remember exactly what it was) on felt and tried to sew it to the towel after I had ironed the two materials together but it bound up my sewing machine. I’m wondering if the wonder under would bind my sewing machine like previous iron on mediums. I really want to cut my felt on the cameo but so far the freezer paper isn’t working out and I’m frustrated. Also I have the new cameo 3 with the auto blade. I’ve tried it with that and with my deep cut blade and it either bunches the felt or pulls away from the freezer paper. Any thoughts or suggestions? There are different kinds of Wonder Under and Heat N Bond. Some are not for sewing and will mess up your sewing machine. Since I created this post, I discovered that I prefer Heat N Bond Lite when sewing and Heat N Bond Ultra when not sewing. If the Heat N Bond Lite doesn’t work for you, I would still try the Wonder Under. It’s really really thin, so you shouldn’t have a problem with that. I found that when using the freezer paper method, you have to get the iron pretty hot to really get it to stick to the felt. 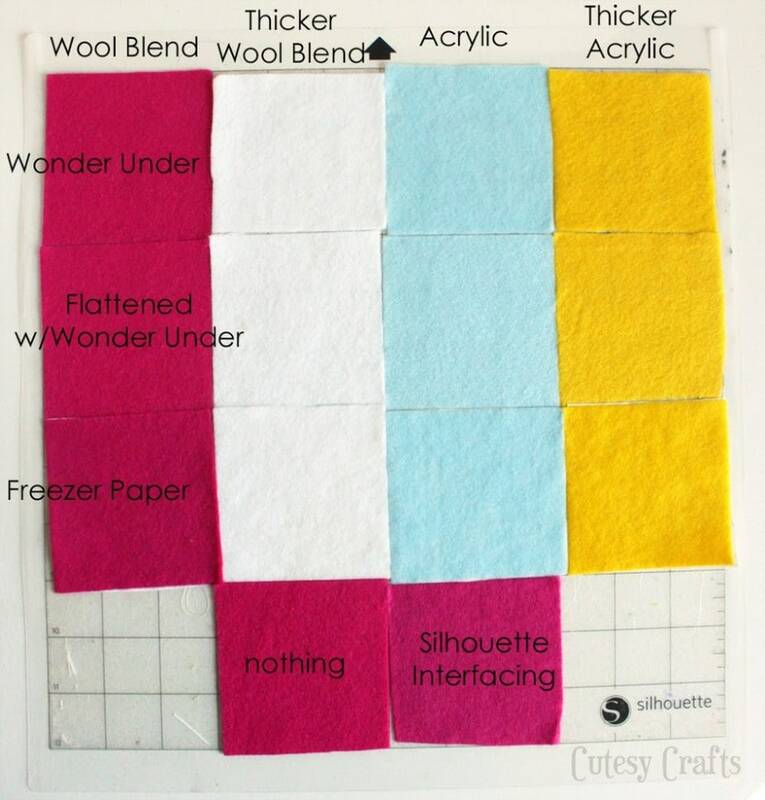 Make sure you are using wool or wool blend (not acrylic) felt. Maybe do some experimenting by cutting right after ironing or waiting a bit until the felt has cooled. I’m not sure, but that might make a difference. I had varying results when using freezer paper. Sometimes it worked, sometimes it didn’t. The group I’m in is called The Silhouette Challenge. The group kinda died down, and I don’t think anyone is accepting new members right now though. The site, Silhouette School is a great resource though. You should check it out! question about Heat N Bond Ultra. Have you ever tried Heat N Bond Ultra instead of using wonder under? Do you think it will work? And will these fusible webbings create a sticking or shiny appearance of the felt? Yes, I found that I actually do prefer Heat N Bond. It leaves less residue on your cutting mat. Use Heat N Bond Lite if you plan on sewing it and Ultra if you don’t. The side you iron it onto will be shiny. Do you know if there’s a “trick” to determining what thickness to start with when experimenting with a new material? I know there’s going to be some trial and error, but it would be nice to know how to get it kinda close to start with. The software has a list of pre-set materials that are a usually a good place to start. I also like to do an internet search to see if someone else has already done it. Then I can just use their cut settings. For felt, I just knew it needed to be the highest possible settings because it’s so thick. How long does one cutting mat last for you? I tried the wonder under but I think my mat isn’t sticky enough because it still bunches when it goes back in the direction it just cut. I also cut out leather and it is pretty covered in stuff. I recently bought a new mat but I don’t want to ruin it just yet but if that is the only way I will be able to cut the felt then I guess I should try. Honestly, I don’t know. I’m really bad at keeping track of that kind of stuff. I did find out that using Heat N Bond makes less of a mess on my mat, so I try to use that now instead.